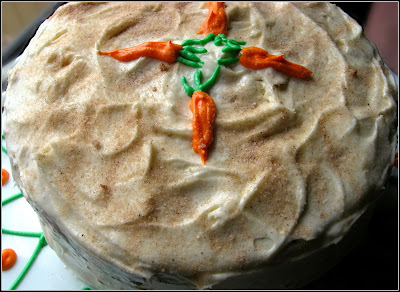 The BEST spiced carrot cake topped with cream cheese frosting. Preheat oven to 350 degrees F. Grease and flour 3 (8-inch) cake pans, using your preferred method. In a medium sized mixing bowl, sift together flour, baking powder, baking soda, salt, cinnamon, ginger, nutmeg, and clove. In a large mixing bowl, using an electric mixer on medium speed, beat together butter, oil, brown sugar, and granulated sugar, until creamy, about 1-2 minutes. Beat in vanilla, and one egg at a time, until well combined. Reduce mixer speed to low, and beat in flour mixture, alternating with the milk, until combined, about 1-2 minutes (always remember to scrape down the sides of your bowl). Stir in carrot, pineapple, and pecans, using a rubber spatula, until well combined. Scrape batter evenly into prepared cake pans. Bake at 350 degrees F, for 30-35 minutes, or until golden brown, and cake springs back when pressed gently, in the center. Cool pans on a wire rack, for 10 minutes. Run a knife around outer edges, and invert cakes onto waxed/parchment paper, to cool completely. To make the frosting, beat together cream cheese, and butter, in a large mixing bowl, using an electric mixer on medium speed, until creamy, about 1-2 minutes. Beat in vanilla, and sift in confectioners' sugar, gradually, until frosting is smooth and creamy, about 2-3 minutes (remember to scrape down the sides of your bowl). *To toast the pecans, place in a dry skillet, over medium heat, and cook for 4-5 minutes, stirring frequently, until golden brown and fragrant. I actually toast mine in the microwave-it's faster and easier. Just place them in a small bowl, and microwave them for 40-60 seconds, tossing every 20 seconds, or so. 43 comments on "Carrot Cake with Cream Cheese Frosting"
You had me in fits of laughter with your announcement. I'm very glad to hear your mum is doing well and I hope that things won't get too stressful for the family. 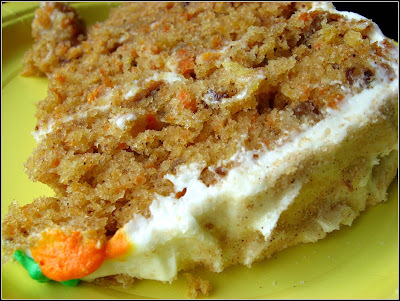 Your carrot cake looks delicious and I agree cream cheese frosting is the best! 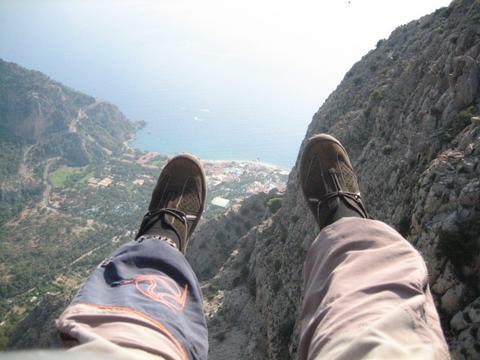 You're crazy! baking at midnight! hahaha. Hey, can I have a piece of that cake? The competition was awesome. It'd be even cooler if you could've tasted them all! So happy to hear that your mom is doing better. The cake looks wonderful. I do love cream cheese frosting for sure. Congratulations on hosting a great event and congratulations to the winners! first things first--glad your mom is healing well! good for you for coming up with your own recipe (in the middle of the night, no less)!! That looks delicious! Your carrots on top are very pretty! I am also glad to hear that your mom is doing better. That is such a relief. And the entries were really good, tough choice. Congratulations to the winners yay! I'm glad to hear your mom is doing better. And I'm sure she would be smiling after having a slice of this delicious cake! huzzah for the winners! i can't believe i totally forgot to enter! i love carrot cake. i love everything about it. i especially love when it has little orange carrots on top, as this one does. I was giggling out loud reading about your judging panel. I know I would have a hard time picking out winners! I'm really glad your mom is doing better. And yes, definitely cream cheese icing is super tasty! I'll eat cream cheese frosting for lunch if I have the opportunity. There is nothing like it. Glad your mom is doing okay - thanks for the update! Just say the word and I'll send lawyers, guns, and money! So glad Mom is doing better. What a blessing she is going to be fine! 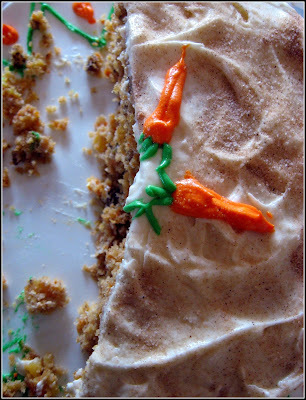 Great carrot cake...an overlooked and sometimes forgotten dessert wonder! My Mom made it all the time when I was a kid, and it was my fave. Glad to hear your mom is better! The caks is wonderful and nothing beats cream cheese frosting. I'm surprised and pleased that sweets won all-out in the top 3. Congrats to the winners and thank you Emi for hostessing under duress and throw me a slab of that carrot cake...it's one of my faves. Im so happy your Mom is doing well. A Easter Miracle for sure.This was such a fun contest. Congrats to the winners and Emiline I am so glad that your Mom is doing better. The cake looks awesome. Making carrot cake is on my list of foods to bake. I often get urges to bake late at night. I usually start regretting it while waiting for the recipe to finish baking. One of my favorite cakes, and yours looks delish!! That carrot cake looks nice and light and fluffy and moist and good. Nice carrot decorations! *Zen sneaks in, steals the leftover carrot cake and runs.. So glad to hear that your mother is doing better. Lovely entries and excellent choices for the winners. All that cakes and that delicious sounding creme brulee certainly called out to me. I was in hysterics reading the eginning of your post Emiline! (the judging sounded so dramatic!) Glad to see your mum's doing better and thanks for the 3rd place! I'm over the moon! Glad to hear your mom is doing better, hope she makes a full recovery soon. Your carrot cake looks beautiful! Congrats to your pub crawl winners! Glad to hear your mom is on the mend. The carrot cake looks wonderful. Hope you had a nice Easter! Your carrot cake looks beautiful and most of very tasty! Emiline it's good to hear your mum is feeling better. Your carrot cake looks so beautiful! Great job everyone! It all looked so delicious! Great to see you are keeping your sense of humor through all of this! HUGS! Mmmmm... carrot cake... one of my all-time faves! Yours looks so delectable!!! So glad your mother is doing better. And I have a confession...when someone serves me carrot cake (which I do not like) I always smile widely and give a huge thanks...and then I devour the cream cheese frosting which usually accompanies said cake. Love that frosting! Your carrot cake is fantastic, I love it!!! !Looks so yummy . Emiline I'm glad that your mum is feeling much better and you have your sense of humour back. I laughed with your judging attitude. Congrats to all the winners. Waiting for your new event. Thanks everyone! I should really comment on here more often. I used to. Don't know what happened. Catherine- I'm requesting a gun. And $100,000. Please. Thanks for letting us know that your mum is doing better. Great carrot cake! Those cupcakes caught my eye too when I saw the posts. Congrats! That cake looks like one I just ate that a friend made and it was great. I love the combo of carrots, pineapple and nuts! The one I had also included cranberries and it was a pleasant surprise! How often do I wear shirts with collars on them, that you can grab? The answer is not very often. emily, do you think it's possible to use 2 10-inch cake pans instead of 3 8-inchers?